Updating your website should be as easy as editing a Word document. You should never need to hire a developer to make content changes, and you should feel comfortable editing it on your own. We build all of our websites using WordPress, the easiest to use content management system (CMS) on the market. It’s also the most popular, powering 1/3 of all websites online. During the development process we’ll provide you with extensive training, including video tutorials, written documentation, and a phone-based walkthrough of your website. The project won’t be complete until you’re comfortable editing your site’s content. The training materials will be always accessible, so you can refer to them later and provide them to your staff. When viewing any page of your website, you can add /edit to the end of the URL in the address bar. You’ll be asked to login, and then taken to the Edit screen for that page. We use the Slash Edit plugin to add this functionality. Alternatively, you can add /wp-admin to the end of your website’s main URL in the address bar (ex: billerickson.net/wp-admin). You’ll then be asked to log in with your username and password. Here’s an example of the login form. Once you’re logged in, when viewing any page of your site you’ll see an “Edit Page” link at the top. 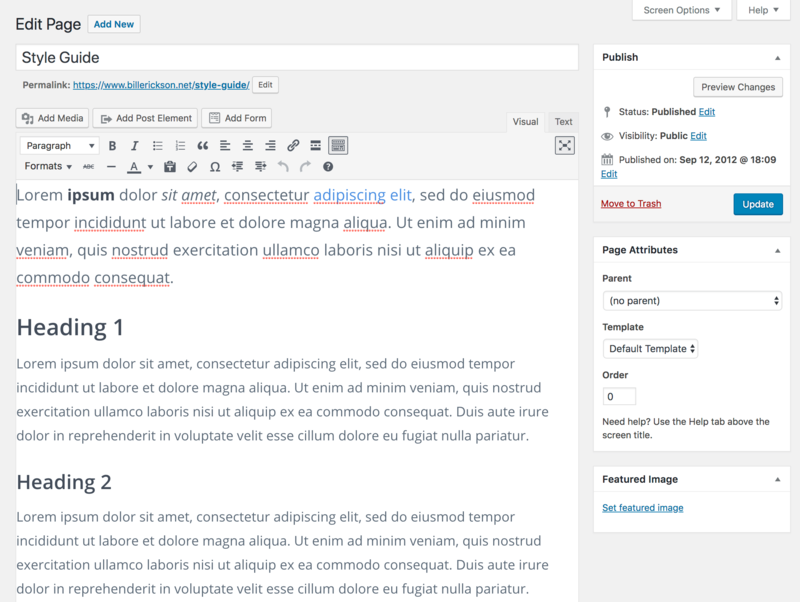 The content inside the editor will be styled to match your site, so as you create content you’ll know how it will look to visitors. This is the edit screen for my Style Guide page. The “Add Media” button lets you insert images. “Add Post Element” may be present if we build custom functionality for you. “Add Form” lets you insert a form you have created with WPForms. The Paragraph dropdown lets you change content from standard text to one of the many heading options (h1 – h6). The other buttons in the top row are similar to Word (bold, italic, bulleted list, numbered list, quote, left align, center, right align, link). The last icon opens up the second row of options. In the second row, the Formats dropdown lets you add additional styling options to different elements. For instance, you can turn a link into a button, make a paragraph larger or smaller, or change the color of a heading. These are custom styling options that we build for you based on your specific needs. From the admin bar at the top of your website, hover over “New” and select type type of content you want to create (ex: New Post or New Page). You’ll see the same editor as shown above. You can use the “Page Attributes” box in the right column to select a parent page, custom template, and/or specify a page order. 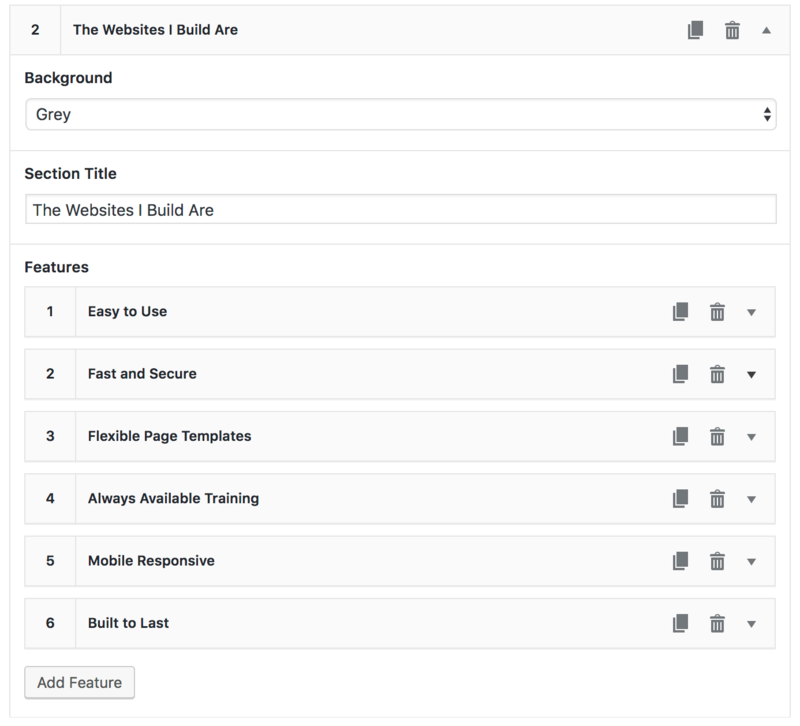 When creating a post, you can use the right column to select the categories and tags applied to it. You can also upload a Featured Image, which will be the image thumbnail used in post listings (ex: your Blog page). Some pages are more complicated. Rather than try to fit everything into the editor shown above, we build custom editors in the backend to simplify your editing experience. We’ll provide you with all the tools you need to fully customize these complex pages, while keeping the editing experience as simple as possible. For more information, see my article on modular templates.